Stu was born in Preston but currently resides in New York City. 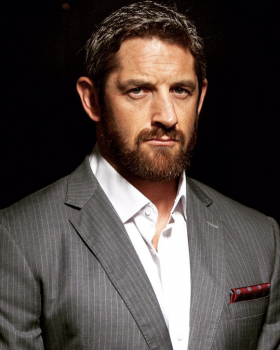 From 2010 - 2016, Stu was signed to World Wrestling Entertainment (WWE) as Wade Barrett/King Barrett/Bad News Barrett and has been a major part of their brand for the last 6 years. He is hugely well known around the world and is the most successful British wrestler of the last decade. Stu is the UK host of Netflix's ULTIMATE BEASTMASTER Season 3 which went live, globally, from September 2018. Sylvester Stallone serves as Executive Producer. He was also seen on ITV every Saturday night this Summer as the main face of WORLD OF SPORT WRESTLING which is making a hotly anticipated comeback to British Television. Stu made his acting debut in the Colin Farrell & Noomi Rapace film DEAD MAN DOWN as Kilroy. His film work includes the lead role of Bishop in a new WWE Studios film ELIMINATORS (directed by James Nunn), John Gold in action film VENGEANCE (Evolutionary Films/Saban Films) and FANGED UP, a new horror comedy alongside Steven Berkoff & BAFTA winner Lauren Socha. He recently shot a new pilot, ALTERNATINO, for Comedy Central USA. Stu is currently reprising his role as John Gold in VENGEANCE 2 opposite Vinnie Jones.